The Rosenzweig–MacArthur system is a particular case of the Gause model, which is widely used to describe predator–prey systems. In the classical derivation, the interaction terms in the differential equation are essentially derived from considering handling time vs. search time, and moreover there exist derivations in the literature which are based on quasi-steady state assumptions. In the present paper we introduce a derivation of this model from first principles and singular perturbation reductions. We first establish a simple stochastic mass action model which leads to a three-dimensional ordinary differential equation, and systematically determine all possible singular perturbation reductions (in the sense of Tikhonov and Fenichel) to two-dimensional systems. 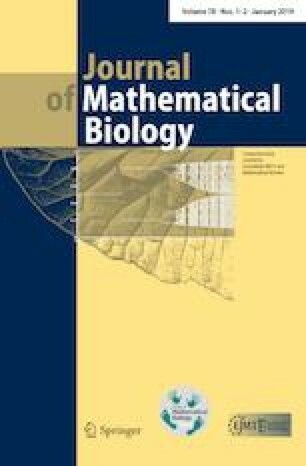 Among the reductions obtained we find the Rosenzweig–MacArthur system for a certain choice of small parameters as well as an alternative to the Rosenzweig–MacArthur model, with density dependent death rates for predators. The arguments to obtain the reductions are intrinsically mathematical; no heuristics are employed. N. Kruff and C. Lax gratefully acknowledge support by the DFG Research Training Group GRK 1632 “Experimental and Constructive Algebra”. The online version of this article ( https://doi.org/10.1007/s00285-018-1278-y) contains supplementary material, which is available to authorized users. We thank two anonymous referees and the Editor-in-chief, Mats Gyllenberg, for helpful criticism and comments on earlier versions, and in particular for alerting us to a number of references. The competitiveness of system 3 was noted by the second referee, as well as the applicability of Poincaré-Bendixson theory.